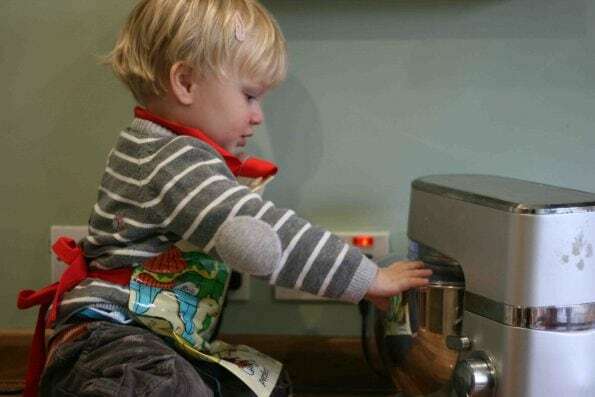 When you picture a kitchen and a toddler you might automatically thing of all the dangers that you wouldn’t want them going near – ovens, cookers with hot pans, knives, and potentially a lot of mess! You might be surprised however at the number of things they are perfectly capable of, and more to the point, really enjoy helping with. 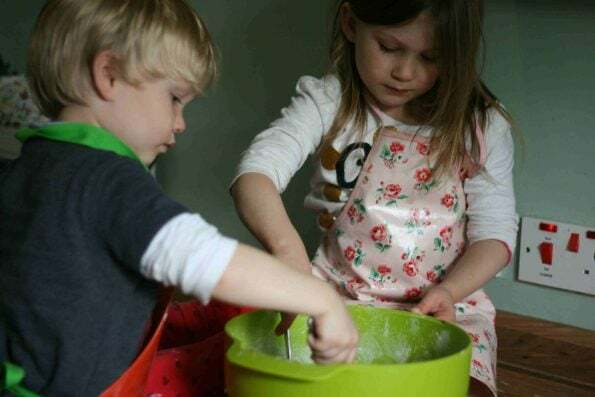 If you want to teach your kids to cook, your budding little chef might like to help you with some of these basic cooking skills. 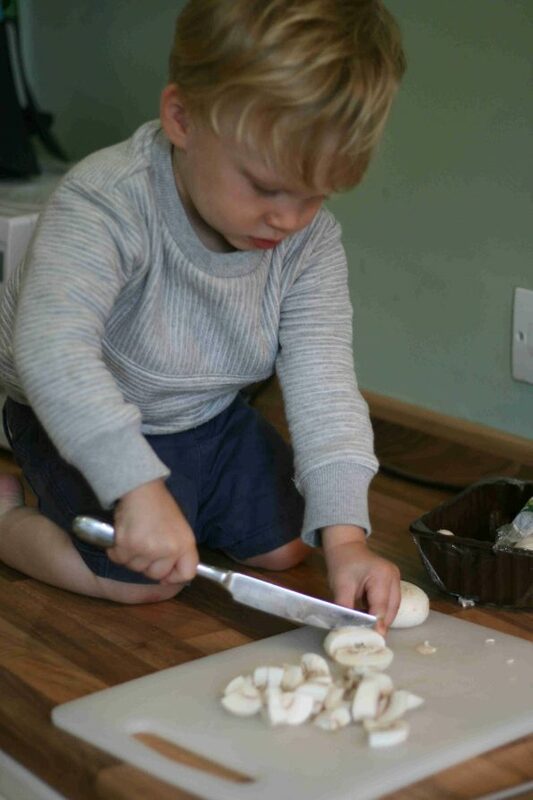 Whether its eggs for an omelette or cream this is a basic skill that most toddlers should be able to master. 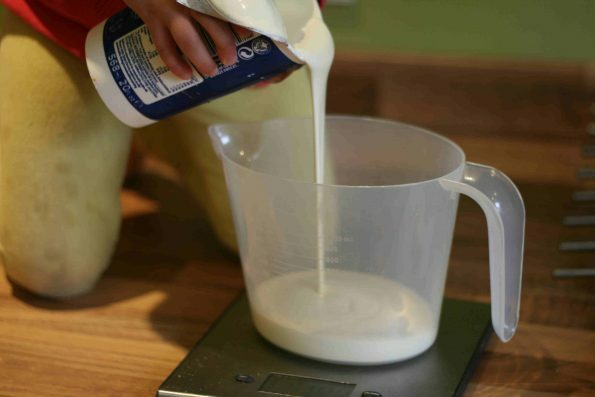 Use a hand whisk, or freestanding mixer for cream. 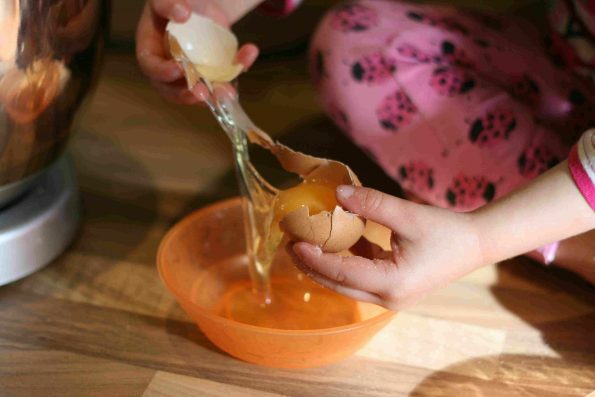 This takes a bit of practice but get your toddler to gently tap the egg on the rim of a bowl before pushing their thumbs in and cracking it open. If you want to be sure that no shell gets in, do each egg separately in a dish before adding it into your main bowl. If shell does get in, try using a a larger bit of shell to fish out any small bits – shell sticks to shell so it’s a much easier way of doing it. We’re still working on this one, but as sandwiches are a great quick lunch it’s easy to get a lot of practice. If butter or marg is too hard, you might find something like mayonnaise easier to spread. This is a great place to start, particularly if you’re baking something together. 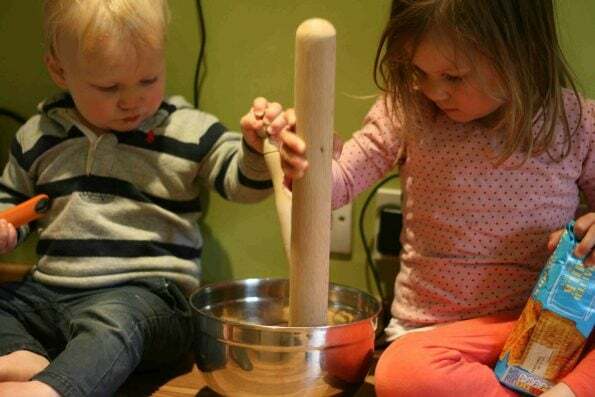 Be prepared for a bit of mess if you’re measuring out flour, but it’s a simple case of giving your toddler a spoon and watching them measure your ingredients into a bowl. I place the bowl on a scale with the numbers facing towards me so I can see how much is going in and to try and stop small fingers pressing any buttons! 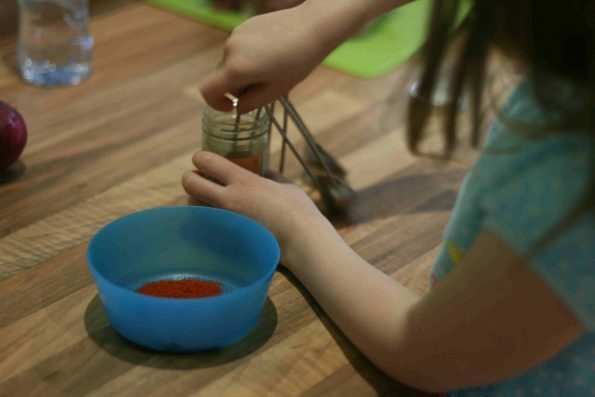 You can also get kids to help measure out herbs and spices when you cook dinner. Just give your toddler a spoon and let them help stir. This is great when you’re baking but you’ll also find lots of opportunities while you’re cooking dinner – whether it’s a pancake mixture or some spices for a marinade. You can even let them get their hands dirty by helping you mix together and make meatballs from fresh mince. Just like playdough but even better because it’s edible. Something like pizza dough is a great place to start as it can take rougher handling than biscuits or pastry. Check out our favourite rolling recipes. 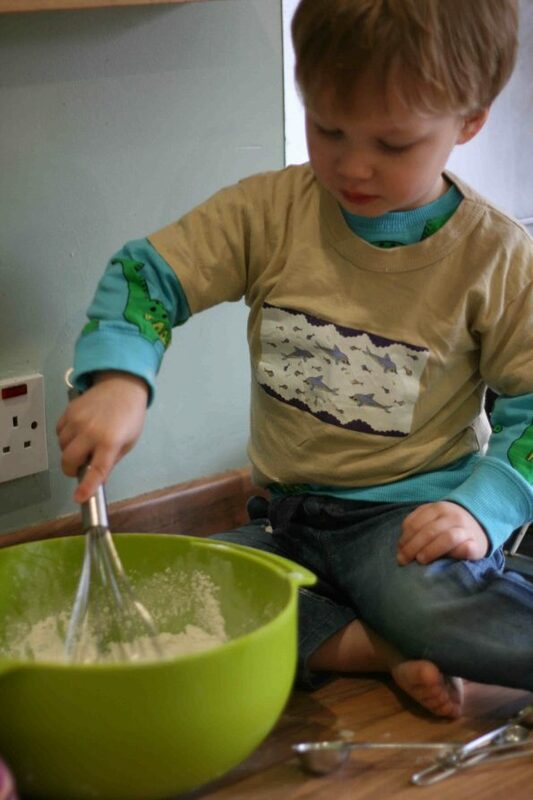 This is a good thing for little ones to practice but keep a close eye on them as it can be messy if it goes wrong! The best way to be accurate when you pour is to put a cup or jug on your digital measuring scales and use the ml setting. Check out our favourite pouring recipes. 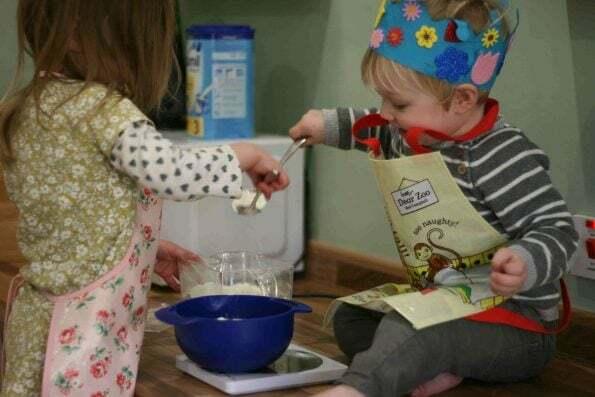 There are lots of ways your little one can help your decorate biscuits and cakes. Make some simple royal icing (icing sugar + water), pop in some colouring, and let them drizzle it on your bakes. You might want to add some sprinkles or buy some of those little ice writers – it’s great for practising finger dexterity and building up their finger muscles. Check out our favourite decorating recipes. Get your toddler to crush biscuits for a cheesecake base or to put in a rocky road. 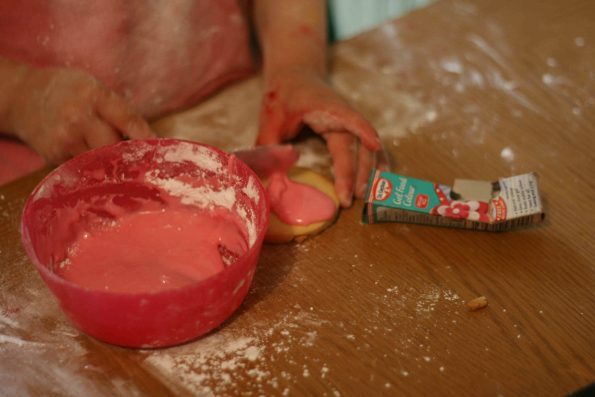 This is some great no mess fun as you simply pop the biscuits in a bag and crush them with a rolling pin! Check out our favourite smashing recipes. 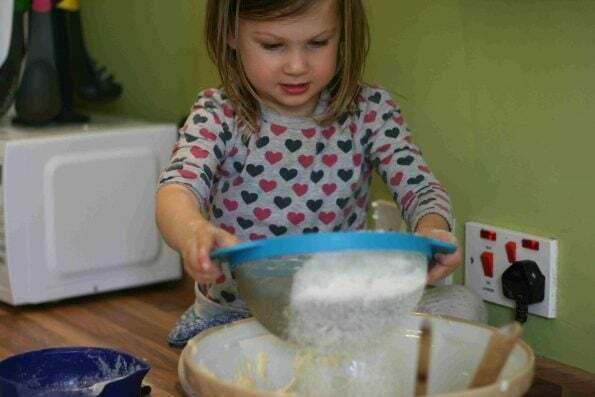 Your toddler might enjoy watching the flour falling through the bottom of the sieve as they transfer flour into a bowl. It makes biscuits lighter but can add a bit to your mess! Check out our favourite sieving recipes. Whether it’s helping you mash potatoes for dinner or mashing up bananas to go into banana bread, this is an easy and fun thing for the littlest helpers in the kitchen. 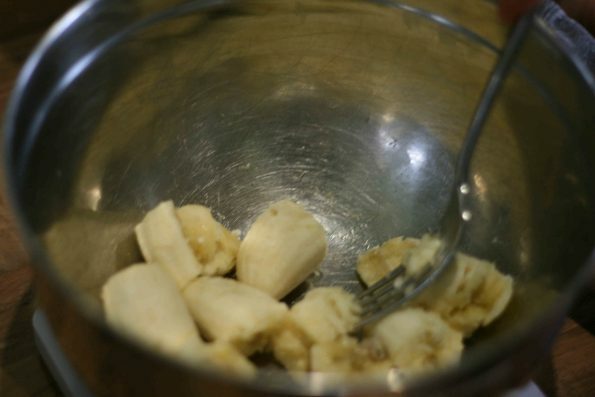 If you don’t have a masher, as long as the fruit is soft enough, a fork should do the trick. Not everything needs a sharp knife. 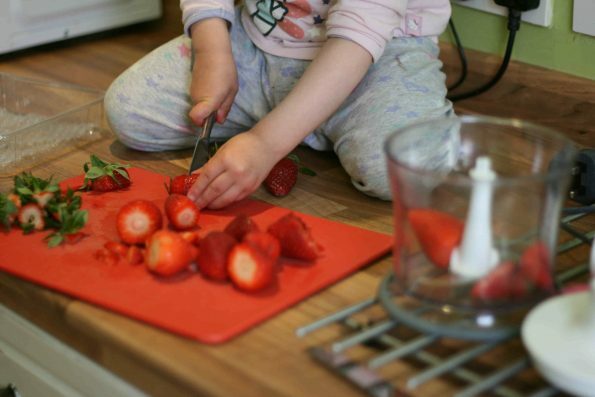 Your child may be able to help you chop things like mushrooms or fruit with a butter knife. Or sometimes we chop our butter before adding it to our baking. Check out our favourite chopping recipes. 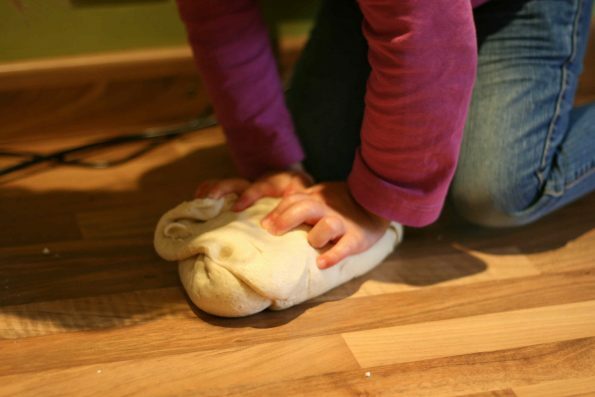 You’ll need to do this when you make any kind of bread. It doesn’t matter if you don’t do it perfectly so it’s a great thing for exercising little hands. They also enjoy seeing how the texture changes the more you knead something. 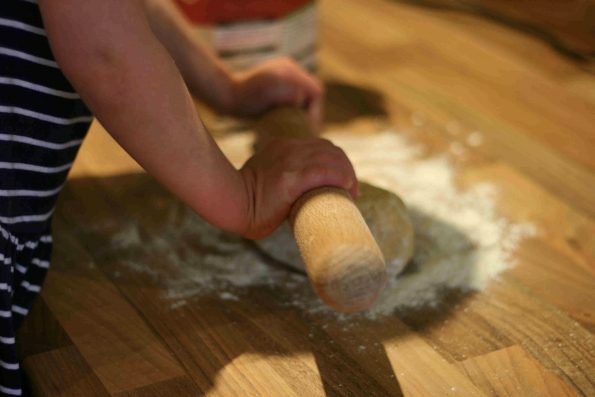 You often have to knead dough for ten minutes+ so if you want to save time and have a freestanding mixer, use your dough hook to do the hard work then finish on your worktop.